As an avid bargain hunter who also loves to redecorate, I’m always on the lookout for Pottery Barn deals. And with Black Friday approaching, I’m definitely on high alert, which is why I’m jumping on my faves that are marked down during the Pre-Black Friday Sale. 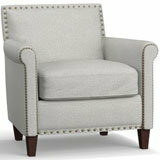 This SoMa Roscoe Upholstered Armchair has been on my radar for quite some time, and I’m ready to take the plunge while it’s half off. I can’t wait for the whole fam to enjoy it this holiday season! Speaking of holiday deals, I buy all of my winter clothes in November while savings are top-notch. 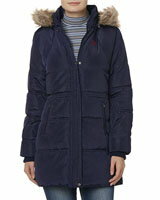 Lands’ End, which is my go-to place for cozy gear to keep me warm, is taking 40% off full-price styles with coupon code COCOA and Pin 6032. The Supima Cotton Fair Isle Cardigan Sweater is at the top of my list for all of the holiday parties I’ll be attending. It’s comfy casual that goes great with a skirt for those evening events. Offer expires 11/19. While I’m getting my holiday shopping out of the way, I better start thinking about what to get my niece for Christmas. She absolutely adores everything Disney (and PJs are her favorite thing to wear), so what better gift than to get her a pair of Minnie Mouse Flannel Pajamas! These adorable PJs are 20% off during Disney’s Black Friday Sale, which is going on now. I never realized holiday shopping could be so easy. Now that I have a gift for my niece, I better pick up something for my nephew. He’s totally into sports, especially skating, so I’m getting him a pair of Heelys for when he’s out and about. These sneakers from Famous Footwear even have LED lights for that ultra cool factor. And the ABEC 5 bearings will provide smooth skating when he’s ready to roll. Best of all, they’re 15% off with coupon code NOVEMBER. I wish I had a pair of these when I was a kid! Coupon expires 11/18. With so much of my shopping already done, I’m might as well get my sister’s holiday gift. She’s really into fashion, and I’ve been wanting to get her something extra special this year. Luckily, I uncovered a fantastic find at Macy’s in their Black Friday Specials section. This Faux-Fur-Collar Asymmetrical Coat is absolutely stunning – and it looks even better at 56% off. I’m definitely snapping this deal up right away before it sells out! Sale ends 11/21. Winter is finally here, which means it’s time to blow the dust off your winter coats. If it’s time to upgrade your wardrobe, head on over to Sears to receive 50% off or more during their Holiday Blowout sale. Bundle up in a stylish jacket like this U.S. Polo Assn. Hooded Winter Coat. With a faux fur trimmed hood and extended length, you can be relieved to know that you won’t have to sacrifice style for comfort. This deal ends on 11/25. Every year I say I’m going to make holiday cards and every year I end up buying a last minute pack of cards from the gas station. Don’t be like me, plan ahead! Right now you can receive 20% off $50+ in Print and Marketing Services from Staples. It's the perfect opportunity to get a head start on your Holiday Photo Cards. 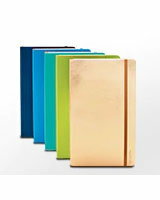 For the technologically challenged, there are hundreds of design templates and other functions to choose. To my friends and family, get ready to receive holiday cards featuring my fur babies. Don’t delay, this deal ends on 12/2. If you’re feeling a bit bah humbug, may we suggest you add a bit of holiday cheer to your home? 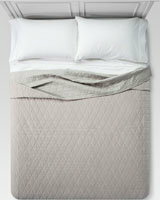 For today only, use the coupon code HERO to receive 15% off select furniture, rugs, and bedding at Target. Cozy up this winter with a Vintage Wash Velvet Quilt. It comes in four stylish colors and adds a rich splash of color to any bedroom. This deal ends on 11/13. Since college, I’ve had a tradition of ordering pizza on Thanksgiving. This year, however, I’m going to attempt to step up my hosting game. Feeling ambitious like me? Enter the coupon code QUICK15 to receive 15% off any order at Kohl’s. We used this as an opportunity to do some last minute prepping for the holiday and picked up an Instant Pot Duo 7-in-1 Programmable Pressure Cooker. 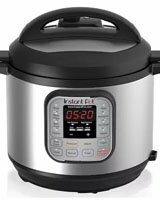 This handy appliance is a pressure cooker, rice cooker, slow cooker, steamer, saute-r, yogurt maker, and warmer all-in-one. Can’t decide what to make at the next family gathering? Make ‘em all! This deal ends on 11/16! Every time I host a holiday event at my place, it never quite feels as festive as it should. If you’re feeling ambitious too, use the coupon code SAVEMORE to score 15% off orders $100+, 20% off orders $500+, or 30% off orders $3000+ at Pottery Barn. Tired of using an oversized sock to hang above your fireplace? 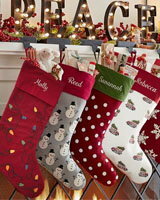 Now you can replace it with a festive Crewel Embroidered Stocking. Are you a snowman gal or perhaps a polka dot boy? Well, now you can be anything you want! This deal ends on 11/13. If you ask me, the best part of Fall isn't the spiced lattes, it's the new wardrobe! This week, I'm treating myself to the hottest deals on the web and I'm taking you with me. First stop: Target. The cooler temps always put me in the mood to splurge on my favorite fall accessory – boots! I just can't get enough of them. 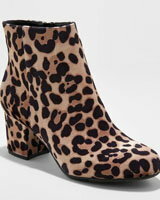 Today, I'm adding this feisty pair of Bridget Mod Booties by A New Day to my ever-growing collection. With coupon code BOOTS20 these babies are 20% off. Don't wait to save, though. This code expires on 10/28. Next up is Bath and Body Works where select Fall scents are now up to 50% off their original price! It's the perfect time for me to stock up on all of my favorite pumpkin-centric products as well as introduce a bit of holiday cheer to my home. That's right, Bath and Body works has just debuted the first of their 2017 holiday collection, including the Tis the Season 3-wick candle. It's blend of red apple, sweet cinnamon and cedar wood sounds delightful, so I'm in for at least two! Coupon code F176563 will save us 20% off your entire order, including sale items. A total score, but it expires on 10/29. I’m headed to the Gap next so I can take advantage of their exclusive online sale with savings of up to 50% off almost everything! Even better, use coupon code ALLGOOD to save an extra 20% off select styles. 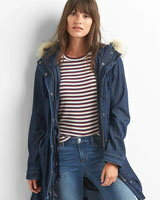 I just added this Denim Faux-fur Parka to my cart, and it showed up for under $100!!! Can you tell that I'm just a bit excited about this deal?! My weeks-long quest to find a cosy winter coat that won't break the bank has finally ended. I suggest you get in on this goodness NOW, the sale and code both expire on 10/29. This cold-weather shopping spree wouldn't be complete without picking up something for my dear husband. (See, it's not all about me!) 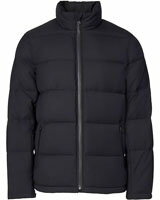 He's been looking for a plain black jacket for this winter and I think this CORDURA Down Puffer Jacket from Banana Republic fits the bill nicely. At 30% off, I think the price tag is pretty nice, too. Through 10/29 you'll find hundreds of styles on sale in-store and online at Banana Republic for up 50% off the original price. Of course, if you order online like I did, you'll also get free standard shipping if you spend $50 or more. Our last stop this week is Old Navy where we'll save 20% off select styles with coupon code SWEET. I grabbed one of these Plush Rib-Knit Sweaters (in the Lime Stripe) not long ago and I love it so much, I now need one every color! The code applies to everything except clearance items, so don't hold back! Stock up on cold-weather essentials for every member of your family or save a few extra bucks on your favorites from last season. Whatever you do, don't wait! This code expires on 10/30. If you don’t plan on dressing up this Halloween, don’t feel bad. You can instead use the money you saved and the coupon code SPOOKY with pin 367 to receive 40% off regular-price styles at Lands’ End. Treat yourself to this Cozy-Lofty Cable Turtleneck Sweater this holiday season. It’s hip-cover tunic length and chevron cables add a flattering touch to this comfy cold-weather staple. But hurry, this deal ends on 10/23. We’ve got a treat without the tricks. Type in the coupon code OCTDM50 to pick up 50% off any one regular-price item at Michaels. If you’re not particularly crafty, don’t sweat! Pick up an adult coloring book and let your stress fall away with each stroke. The Everything Beautiful: A Coloring Book for Reflection and Inspiration is a great way to unwind after a stressful day of adulting. This deal ends on 10/28. Believe it or not, Hobby Lobby sells items for the not-so-crafty, like ourselves. So if you don’t know how to use knitting needles, you’re in luck. Use the code 7578 to receive 40% off your highest priced eligible item there. Looking to welcome more positivity into your life? Pick up this Peace Sign Hand Canvas Wall Decor. Hang it where you most need positive inspiration in your life. This deal ends on 12/31. For years now, every time we see a Gap commercial we’re reminded of two things: those catchy jingles and tons and tons of cute clothes. If you’re feeling nostalgic like us, you’re going to love this. Right now you can receive up to 75% off during their Great Big Fall Sale. Not sure where to start? Don’t sweat, we’ve got you covered. We’re in love with the Softspun Cowlneck Hoodie and soft it feels! This versatile piece is good for layering, so we encourage you to add this piece to your must-wear list for autumn. Take advantage of this great offer while you can! Score up to 75% off Clearance items at Old Navy. We were feeling pretty sassy and picked up this High-Neck Crochet-Yoke Jumpsuit, because, why not? Not exactly cold-weather appropriate, but we don’t mind. It’s still hot somewhere, isn’t that right, Southern California? Made with 100% cotton, it’s breathable, it’s sleeveless, and it’s sassy. Not sure where we’ll be wearing this yet, but trust us, we’re going to look great when we do!